On May 17, Canadians from coast to coast will celebrate a quintessential Canadian cocktail: the Caesar. The clam-tomato based cocktail, rimmed with celery salt and garnished with celery — or virtually everything but the kitchen sink — is a national treasure revered for its versatility from hangover nurse to brunch sidekick to happy hour party starter. The drink lends itself well to being remixed, giving way to some mighty creative concoctions and turning the traditional tipple to over-the-top fancy. 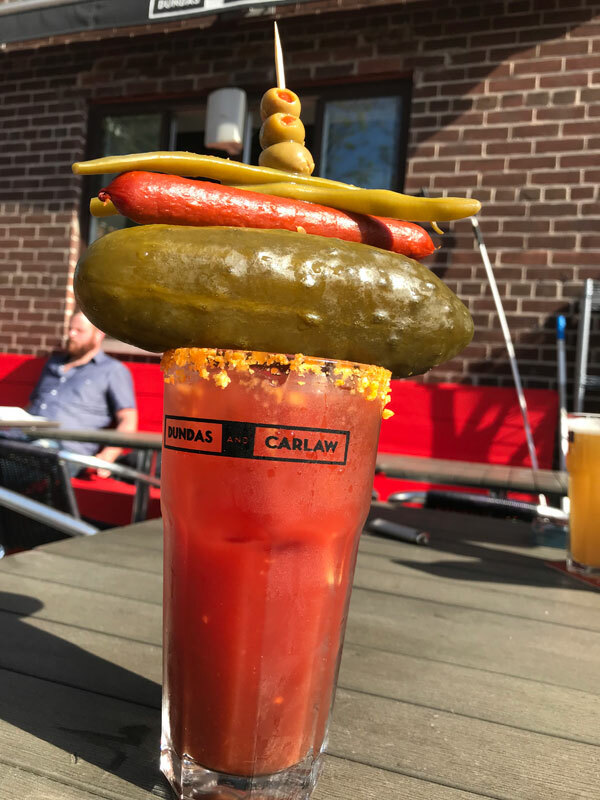 Toronto turns it out pretty great when it comes to Caesars, so to mark the occasion, we asked a couple local spots to show us their spin on the drink. The legendary Sleazer — Sleazy Caesar — at Dundas and Carlaw is a perennial favourite of the city's best-of lists. Why all the hype? For starters, it includes a double shot of vodka and a boatload of accoutrements including a skewer of giant pickles, beans and a pepperette. But the real magic is in the rim job. "We changed our rimmer this summer from Cool Ranch Doritos to Crunchy Cheetos," says Ruben Vina of Dundas and Carlaw. Enough said — we're sold! An experience unto itself, Maple Leaf Tavern's Caesar begins with house-made, cold-pressed vegetable juice and clam stock for their fresh vegetable-clam base. The standard vodka addition is swapped for Bombay Sapphire gin. The Tavern's Caesar is garnished with a cucumber and rimmed with coriander salt for an aromatic twist on the classic drink. The result is light, fresh, fragrant and sweet, with a hint of heat. Have a bar with a caesar that we should feature? Send the details our way!